"A skin cleanser precisely engineered to control and help prevent blemishes and maintain clear, healthy skin." Deeply Cleanse and Calm the Skin while targeting bacteria with none of the side effects of other common products. The world's first facial cleanser with Resveratrol to target bacteria and calm irritated skin, while also moisturizing and promoting a healthy glowing look. Read more about this amazing phenomenon below...and why it is such an incredibly popular alternative to potentially harmful common treatments. Why is this cleanser so much better than the others on the market? Scientific reports from OXFORD University proved that Resveratrol (the main ingredient) targets bacteria better than a harsh ingredient, which is used in many products. If you want to learn more about this, and why the Dermagist cleanser is such a better alternative, read this study: Dangers of Benzoyl Peroxide. Just like any product for acne-prone skin, the power to perform lies in the ingredients. 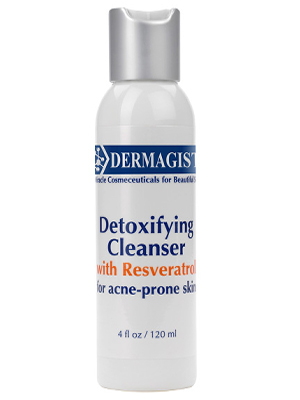 Dermagist's Detoxifying Cleanser for Acne-prone Skin provides an incredible "Bang for your buck". In a cleanser that is designed to help those who are prone to acne, the ingredients that are used must be sensitive to the fact that the skin is already likely to be red and irritated. At the same time, an ingredient needs to be potent enough in targeting bacteria that it can help lessen future blemishes. For many years, people had no choice but to worsen the irritation of their skin, in order to target the bacteria… Up until the study at Oxford University revealed that Resveratrol not only targeted bacteria, BUT ALSO worked to calm the skin and help get "out the redness". Resveratrol, as one of the key ingredients in this cleanser makes it cost a bit more, but the preventative nature of it, combined with the calming abilities it has on the skin, make it a vital ingredient in this facial cleanser aimed at helping those with acne-prone skin. Also, as a daily maintenance product for those who have an occasional blemish, this ingredient can be a life saver. Chamomile extract is a well documented anti irritant that both calms and relieves irritation to the skin. By soothing the aspects that cause redness and irritation, chamomile extract leaves skin refreshed and shielded from Toxins and Free Radicals. Skin that has redness and/ or blotchiness is significantly improved with the daily application of Chamomile, which makes it the perfect ingredient in a daily facial cleanser. Shea Butter, made from the Karite nut tree grown in select parts of Africa, is known for its ability to help a multitude of skin conditions. From broken skin, dryness even stretch-marks are relieved with the application of Shea Butter. It is deeply moisturizing and lifts and tones skin, but is gentle enough to be used on burns and other major skin trauma. Due to its tremendous powers and its natural protective properties, Shea Butter has been used for thousands of years to heal all types of skin problems. The daily application of it shields you from the dangers of sun rays as well as deeply nourishes the skin, leaving it soft and supple to the touch. We are used to hearing about Aloe Vera as a treatment for sun burn, irritation, and even cuts due to its tremendous soothing qualities. But Aloe also deeply moisturizes and significantly softens extremely rough and dry skin. Daily exposure to the sun damages your skin daily, and while it may not appear as a “wound” in the mirror, it is a very harmful condition for your skin that needs attention. Aloe not only soothes the skin and nourishes the cells, it also targets bacteria and aims to kill fungus. Aloe Vera is fantastic protection from the sun's harm and amplifies the success of anti aging treatments when used in conjunction with them. This antiseptic is derived from Tangerines and it naturally targets all unwanted bacteria as well as soothes spasms. But what makes this ingredient so exciting in a daily facial cleanser is the fact that it actually encourages new cell growth, which you may know is the number one way to treat and heal damaged skin. Tangerine oil is also known to help the skin further absorb the nutrients it so desperately needs daily. This allows for deeper penetration of other skin care products that you use, such as creams designed to help blemishes. Furthermore, it attempts to block out the toxins that ultimately damage our skin and cause premature aging. It is perfect for all skin types due to its balancing qualities, keeping the right mixture between oily and dry skin. Product : Dermagist / Dermajuv Detoxifying Cleanser. All Items are new set, and original imported from USA.